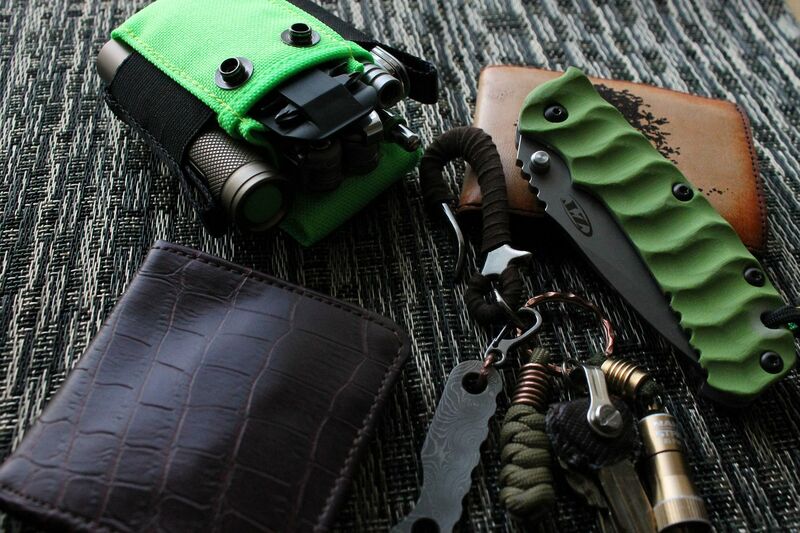 Discussion in 'Gear Reviews' started by Cornholio2188, Dec 13, 2012. 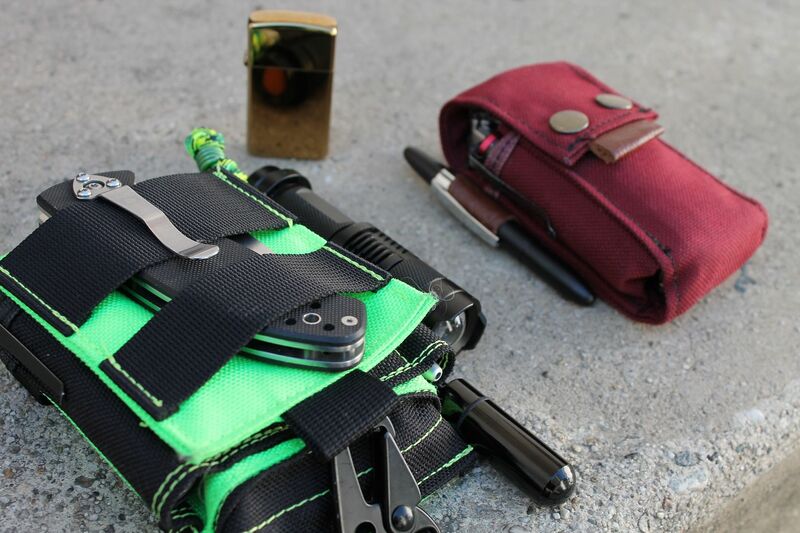 Skinth is a one-man operation with the choicest materials, mostly 1000D PU Cordura (if I'm not mistaken), specializing in pocket organizers and EDC belt pouches for adventurers, survivalists, and EDC'ers alike. 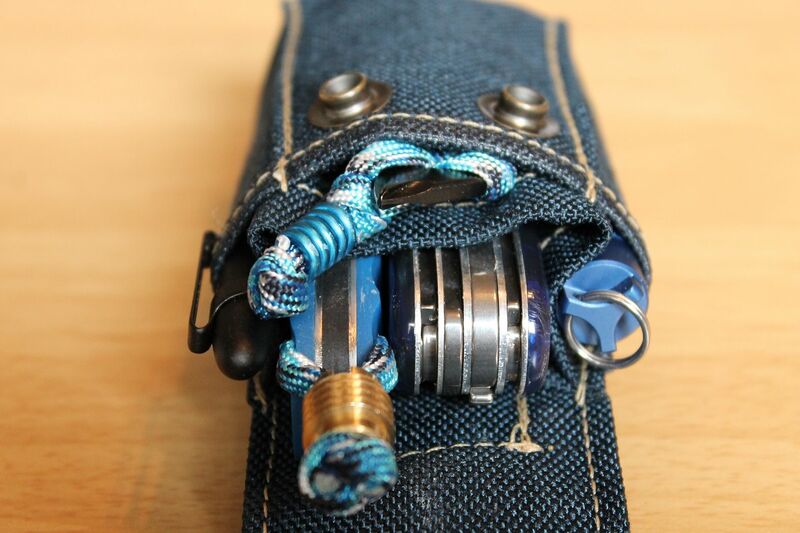 Nearly all Skinths have an available range of custom options, making them both personable and extremely functional. 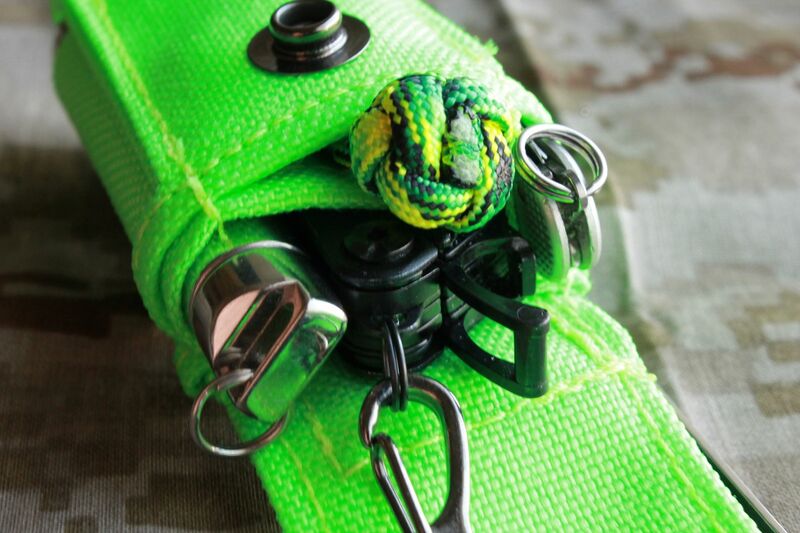 All products are incredible well-tailored, with extreme attention to detail. First off, I'd like to thank Eric (Metropolicity on EDCF)-without him, all my portable gear would be in shambles! He is amazing to deal with and I can't recommend his products more. Fabric, threads, and overall construction is actually overkill-so I'm not worried one bit about anything ripping, ever. Every little detail is immaculate. Maybe you won't quite understand until you see or feel one in person-but really whats 30 bucks to get you started with a Skinth Spartan SP? 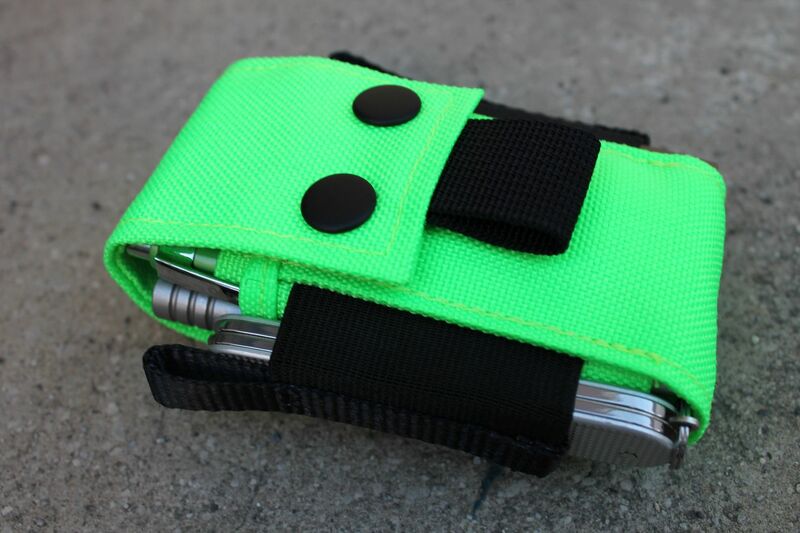 You know you'll easily spend it on something else without blinking-I am, and forever will be a pouch guy-and more specifically a belt pouch guy-and MORE specifically a Skinth-belt-pouch-guy. Don't waste your time with lesser pouches. 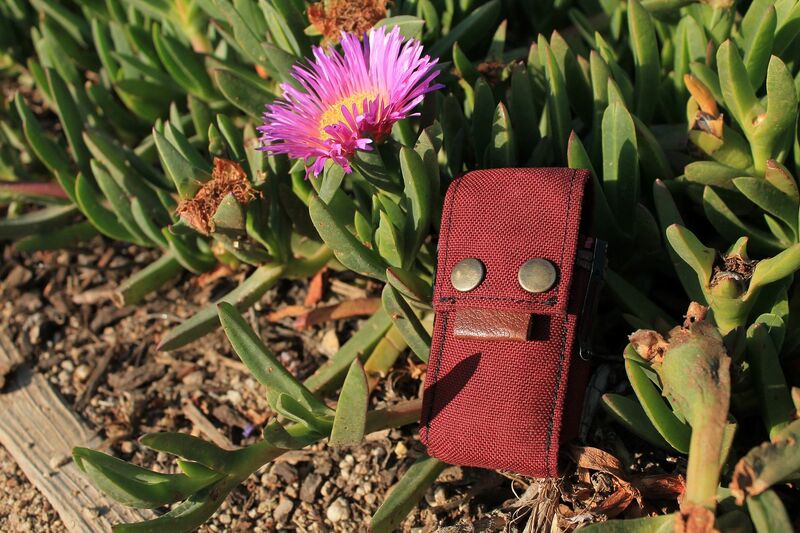 Trust me-you get class, style, and ruggedness with Skinth- you get ONE of those with other MT and phone pouches. 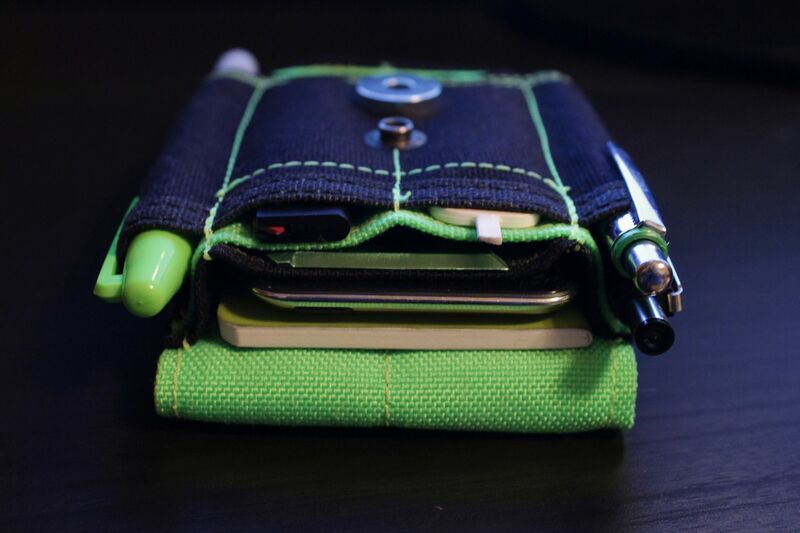 The Skinth SP is designed to hold all iphones (I believe) and other similarly-sized phones. 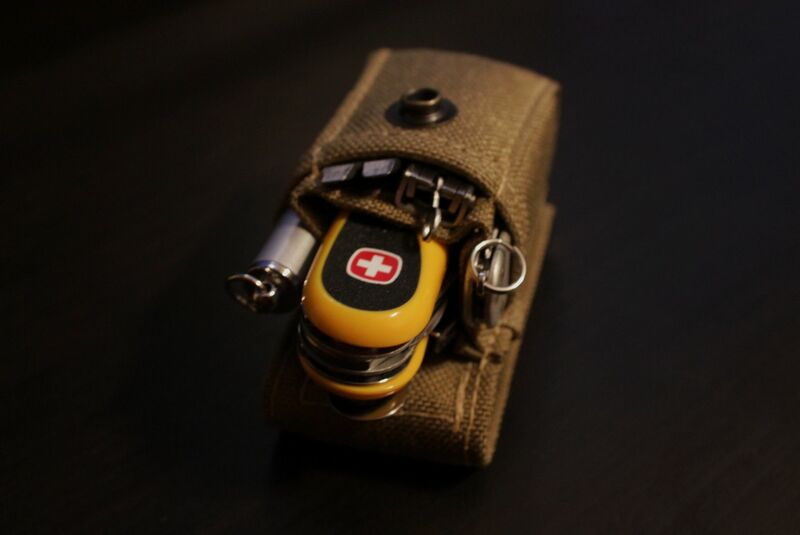 It also fits the iPod touch 4 with the Griffin Survivor Military Case perfectly. Since I used mine to take pictures, I have some alternative setups. 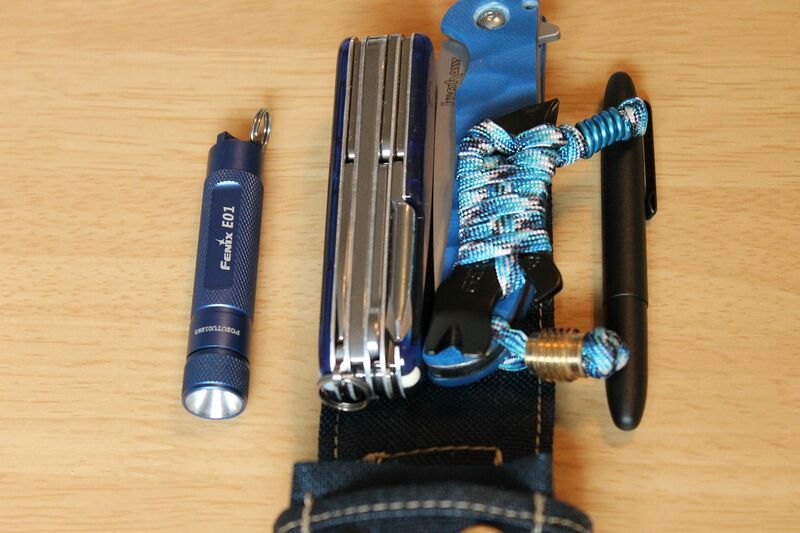 This SP is extremely versatile-from alternate MT/AA lights in the main pockets to Smartphones, you can't go wrong. 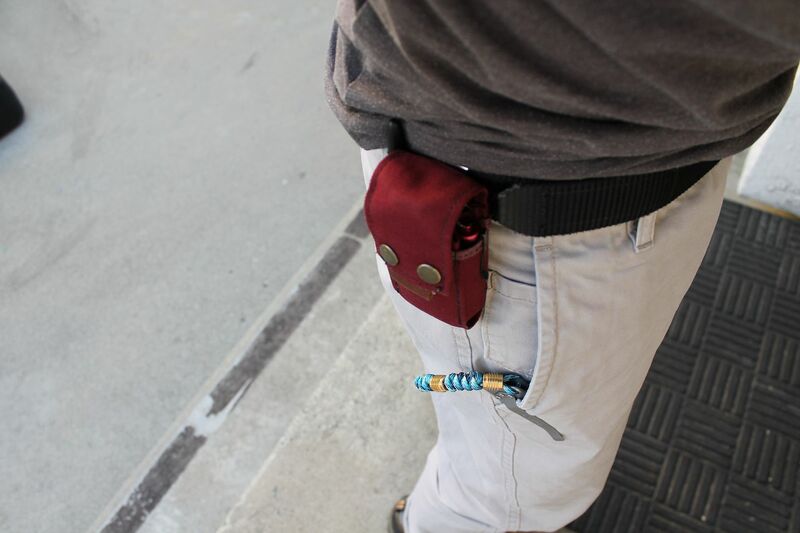 Why carry one of those ugly, bulky, nerdy leather cell phone cases when you can actually wear something that makes sense?! 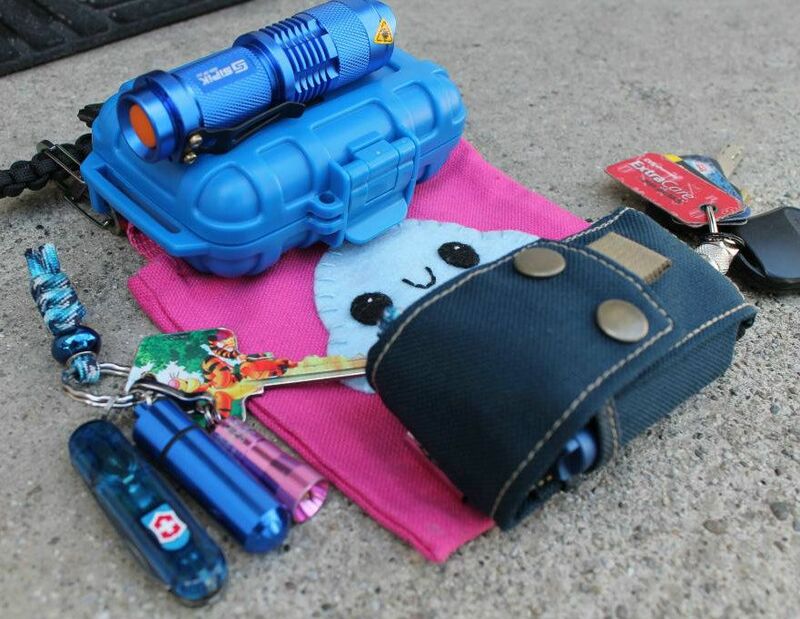 Have your pens, lights, phone, and other goods at the ready-no fishing through your pockets or struggling to clip everything back on. 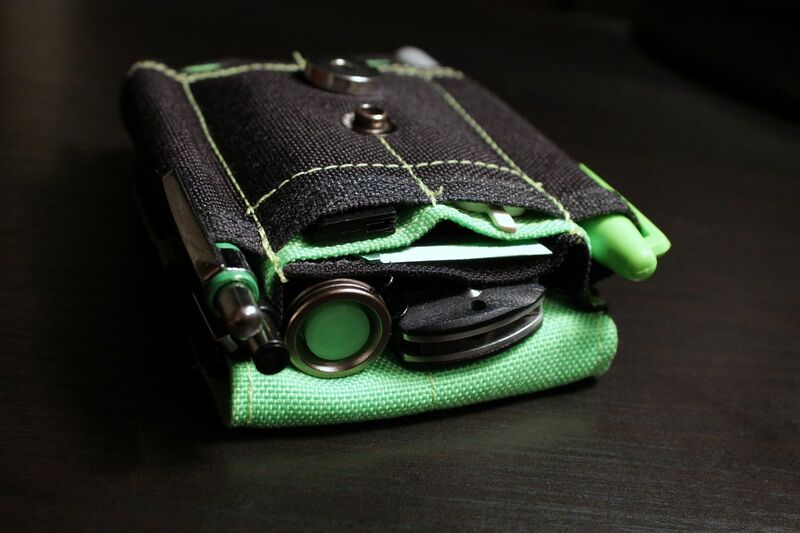 Just retrieve and slide back into the perfectly sized pockets and be done with it (and look more awesome than anyone else in the process!). 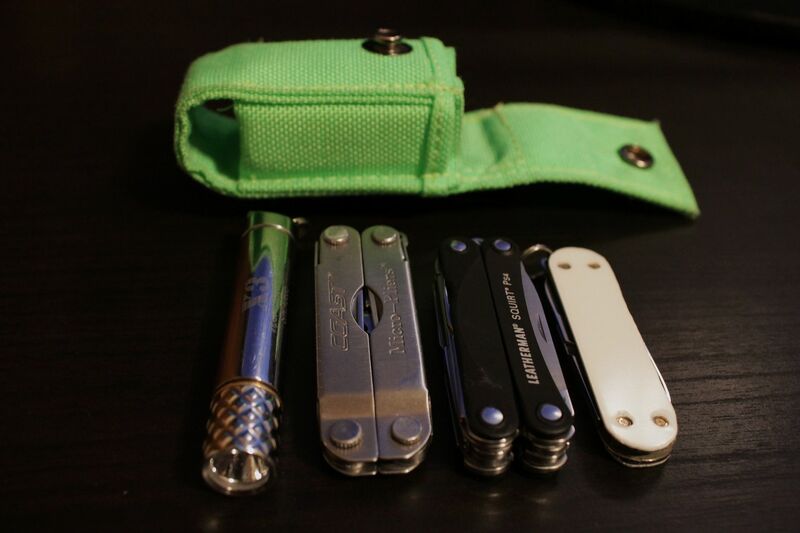 I mainly carry mine on the backpack strap of my Lunada. No Smartphone still, but it fits the brother's iphone 4 like a glove. 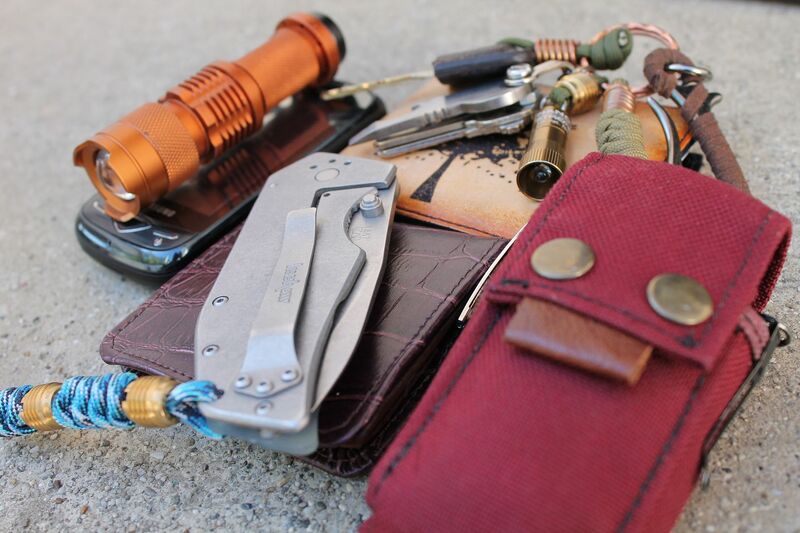 Alternate loadouts: I love this guy because it can do a simple phone/mini edc setup, or carry an entire EDC load, keeping that mess out of the pockets completely. The very first pic on the page was my SP, used when I took it to my best friend's wedding reception. 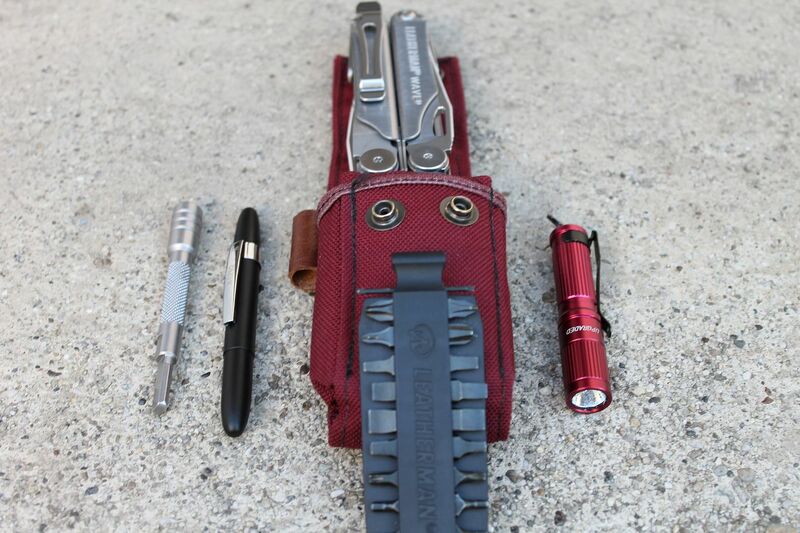 Had my phone, the Wenger, pens, saw, and spare key w/keys on the custom hk clip. Tell me that isn't awesome perfection! 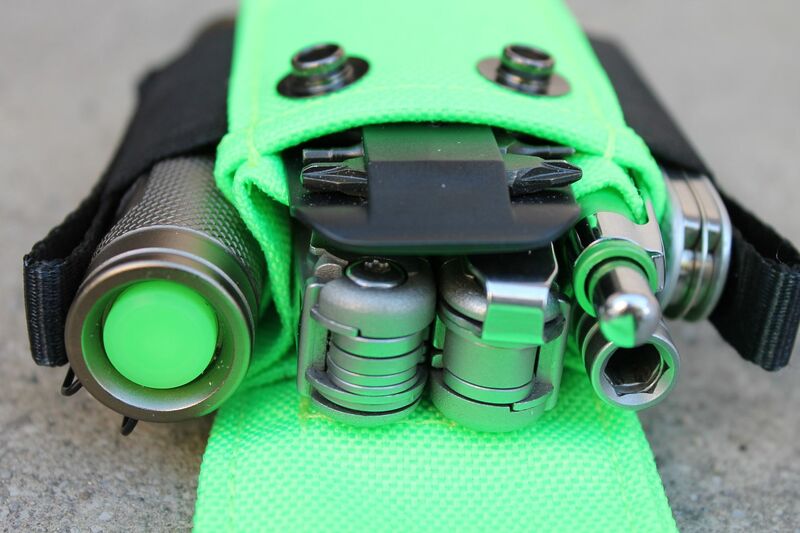 The Skinth L-shield is a perfect size for a Leatherman Charge type multitool (Main pocket) and can hold up to 2 AAA sized flashlights on both side pockets. 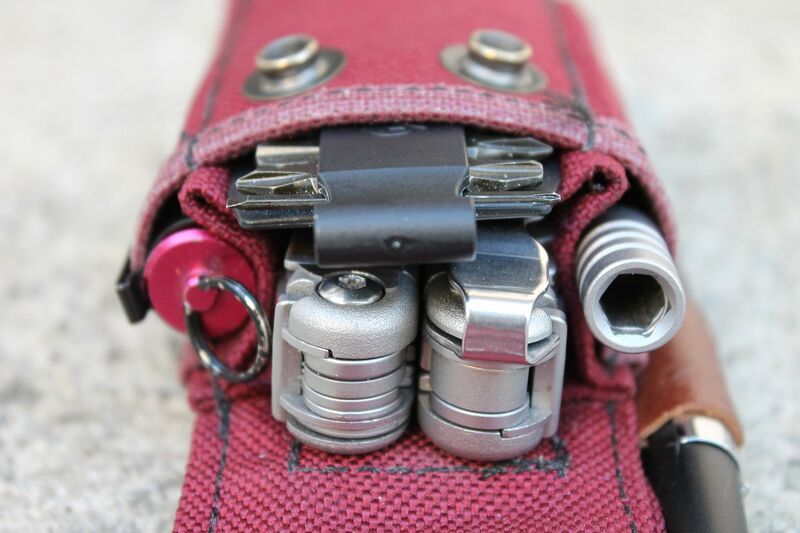 The front pocket is perfect for the Leatherman Bit Kit, and will hold most other multitool bit holders just as well. 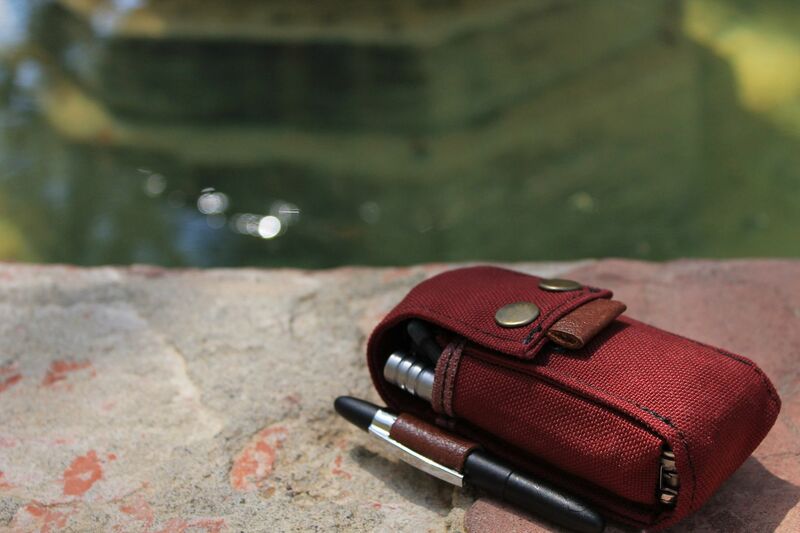 Other pouches don't compare- Skinths are just the perfect combination of form and function. My one-of-a-kind "Gentleman's Skinth" in burgundy. The first thing I noticed when I received my new Skinth L-shield was the expert craftsmanship-not surprised! The next thing I noticed was just how small she is, and how low she sits! 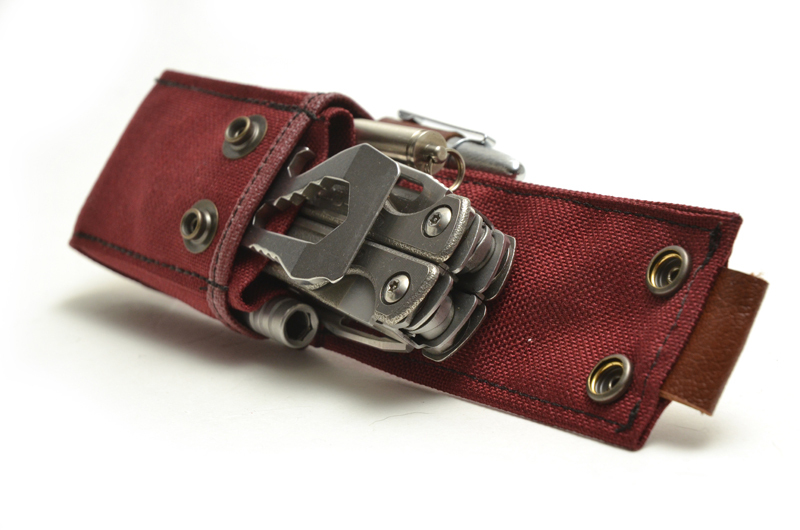 She is barely noticeable on the belt, and the perfect size! People would never look twice! 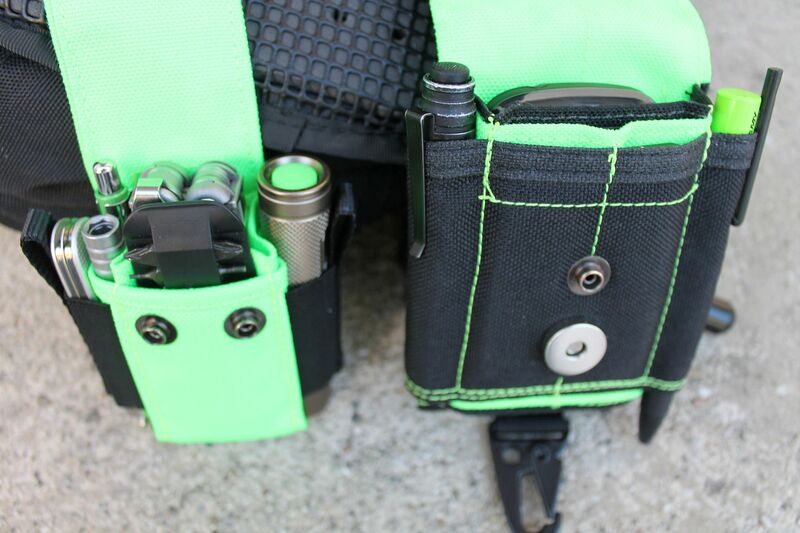 This is a concern for many when buying a "tactical pouch". 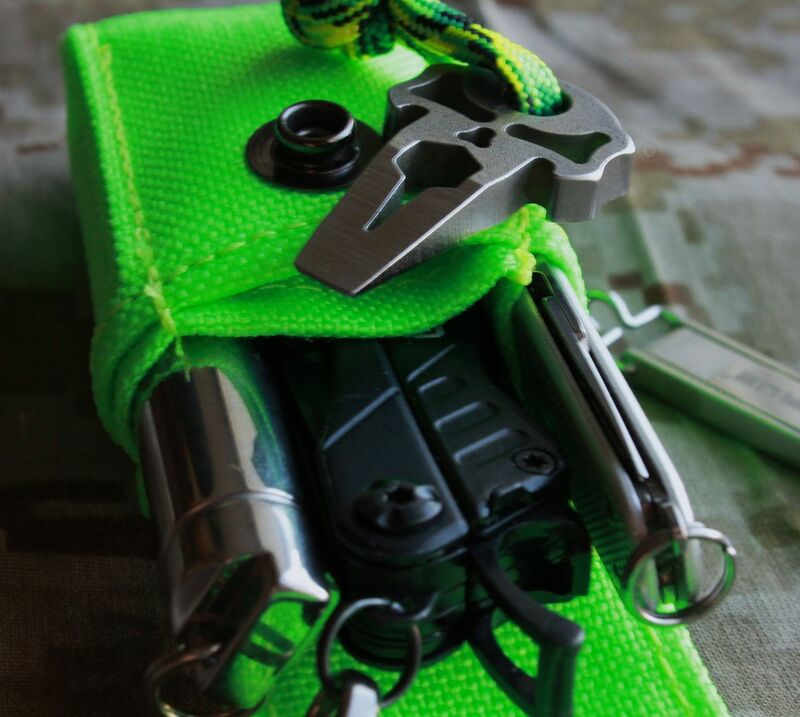 Usually when looking for a pouch, people (especially in the EDC community) look for military grade. This is 1000D Cordura Nylon (am I correct, Eric? 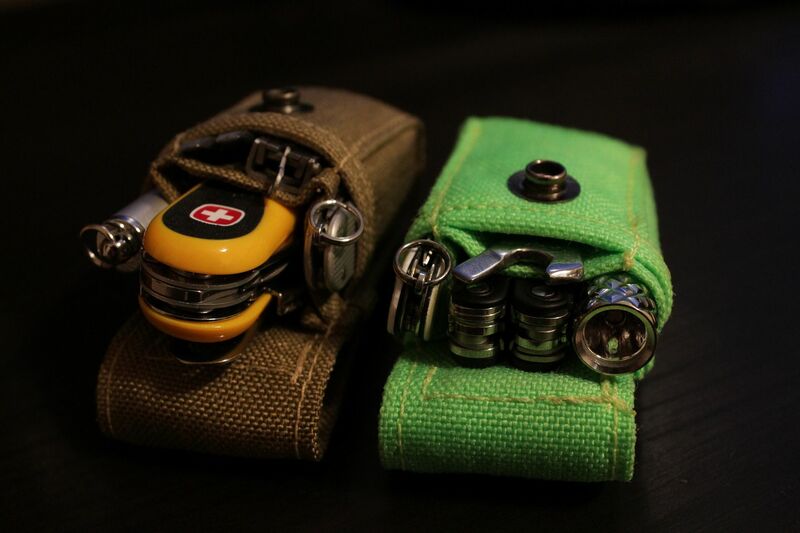 )-which is Mil-Spec and what guys on the battlefield use for backpacks and molle gear, and I might also add that I'm pretty sure Eric also always exclusively uses industrial grade thread-so you don't have to worry about seams falling apart. 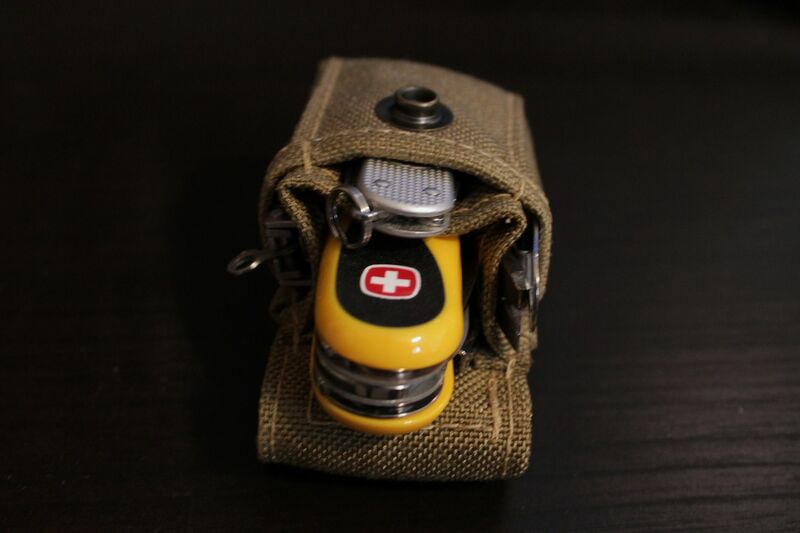 Because of the durability, it could definitely serve its purpose as a "tactical" military sheath-and much less cumbersome to carry (and stealthy ). Same goes for all other Skinths. In this instance, the burgundy would serve its purpose in more canyonlike, "red rocky" terrain-but this isn't a tactical review-just showing potential and ability to hold up in any wide range of circumstances. The leather on this, the color, the size (oh my lawd I can't believe how compact this little beauty is! ), and everything about her is absolutely full of class. It is really, really hard to describe how superior Skinths are as vessels for precious cargo in comparison to other "pouches". This shouldn't even be in the pouch category-but in a class all it's own-kudos to you, Eric (of course ). I wouldn't trust my best gear in anything else (anything less*). She is low on the belt, which is signature of the entire Skinth line-you will never have to reach up high to access the items. Like I said before, you'll never have to reach deep down in the Skinth or try to pinch at anything-designed for easy, top-up access. Everything slides out easily on the first try, and reenters just as easily (LM Wave, LM bit kit and extender, ITP a3, and tweezers), yet still fits snug. The clip is incredibly strong, and seems like it's some heavy duty stainless-so I'm definitely not worried about it one bit. It's very secure, but with a push on the well designed groove at the bottom which acts as a retainer-also aids as a lever (only when removing). It seems a lot like the clips you would find on kydex/leather gun holsters. I couldn't be more impressed! Eric-you did it once again!! 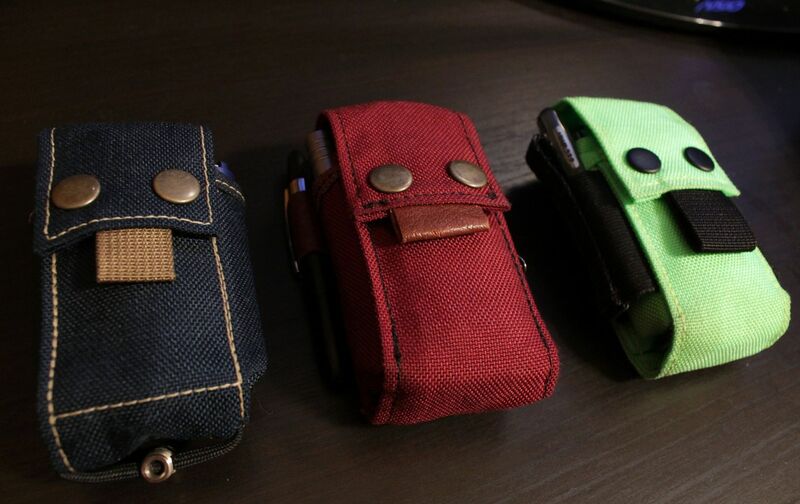 Seriously-if you guys have any amount of money you plan on spending on a pouch, take a chance-get a Skinth. 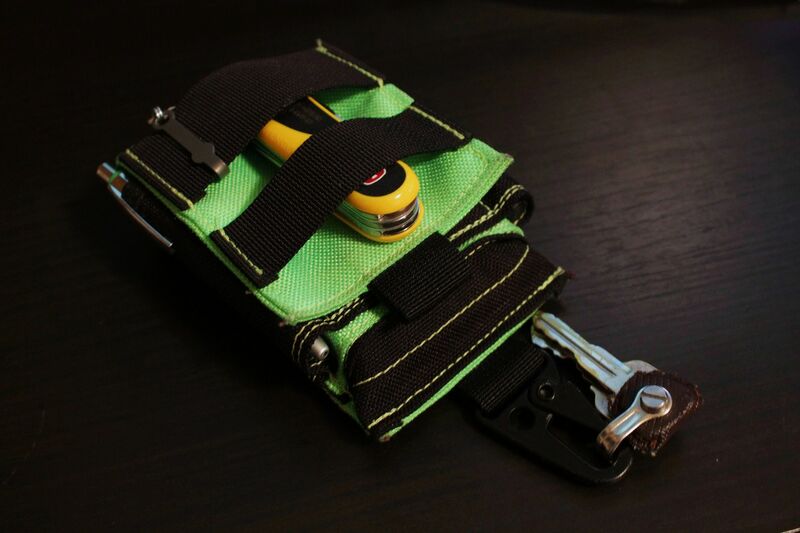 Really, the cheapest pouch, I didn't know when I first discovered, is 25 bucks-25 bucks! (the Spartan OG, or the S-Shield). 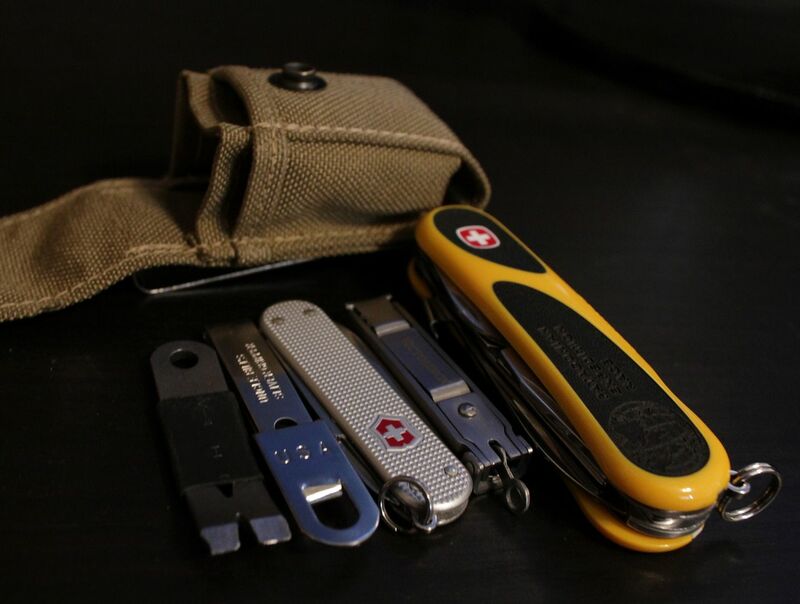 The thing is, you'll find yourself easily spending that on a firestarter you may never use, or a knife you don't really like, a keychain tool that is not an Atwood, or something you'll end up selling later on . Seriously, there isn't a better product out there! Thank you Eric!! *Updated* Some more pics and loadouts. Size of the main body are the same. While the cute looks and compact size are adorable, don't let the tiny size fool you-these guys don't mess around! 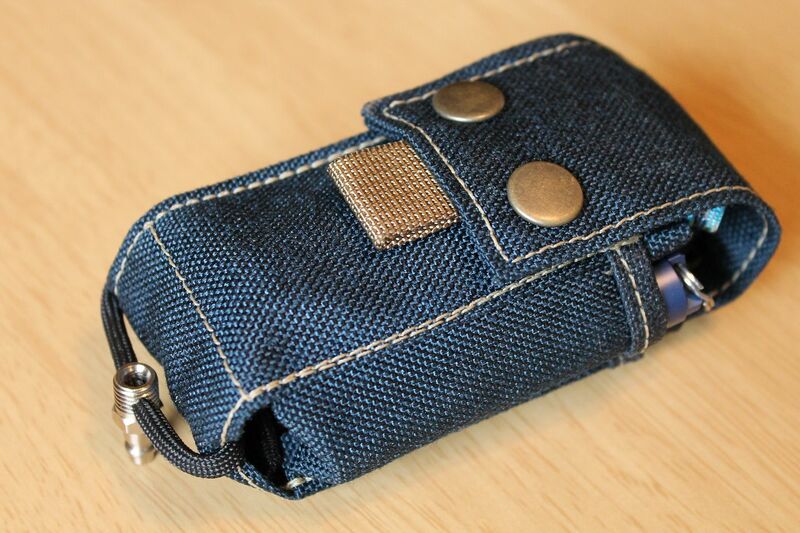 For those looking to pick up a really compact pouch to help keep pocket bulge at a minimum, and sporting a very secure, discreet and stylish means of organization and carry, these are for you. 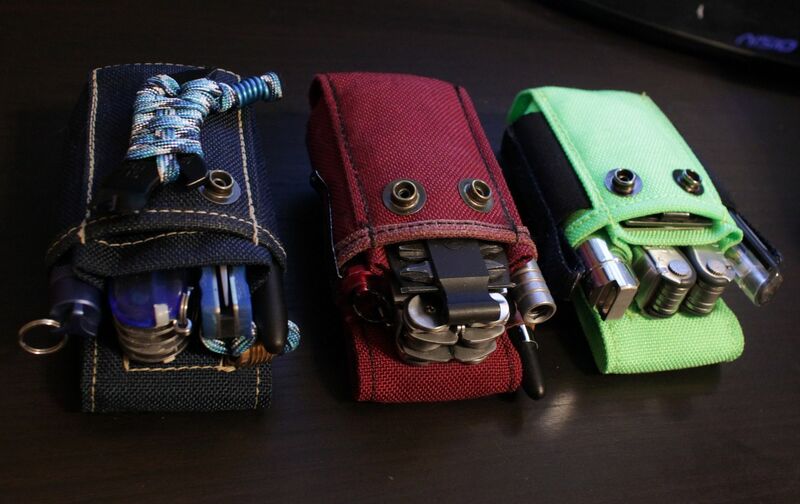 If you're worried about how belt pouches will look or other people lookin at you, these are less noticeable than any phone pouch, and probably any weird 'tooled' leather or studded belt you've ever seen anybody wear. These are definitely less noticeable than awkward pocket bulge-and more importantly, you won't have to feel it, especially, when sitting down or running (which is a huge bother to me). 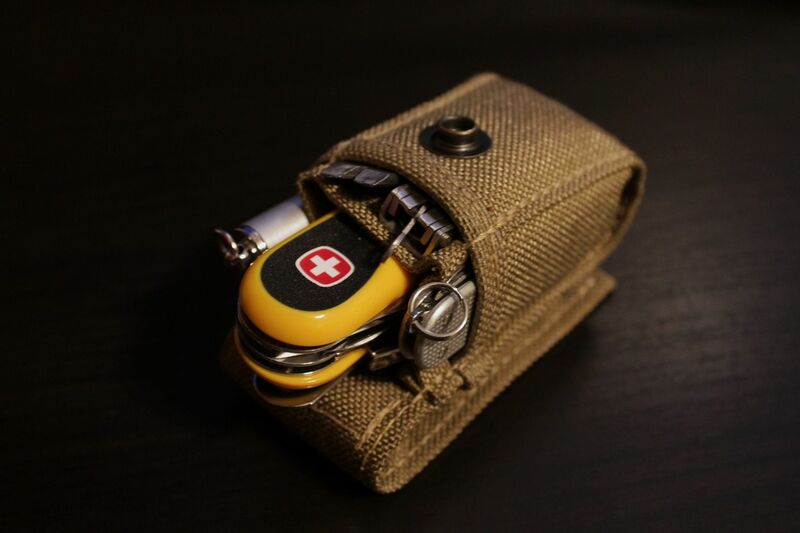 The Micro is the smallest of all the shields, and has the ability to hold a Keyport slide or small keychain tools, such as 58mm SAKS, OPMT's, tweezers, folding nail clippers, and other keychain multitools from most big companies. The light pictured above is a Solarforce X3, one of the smallest AAA lights I've seen in person. 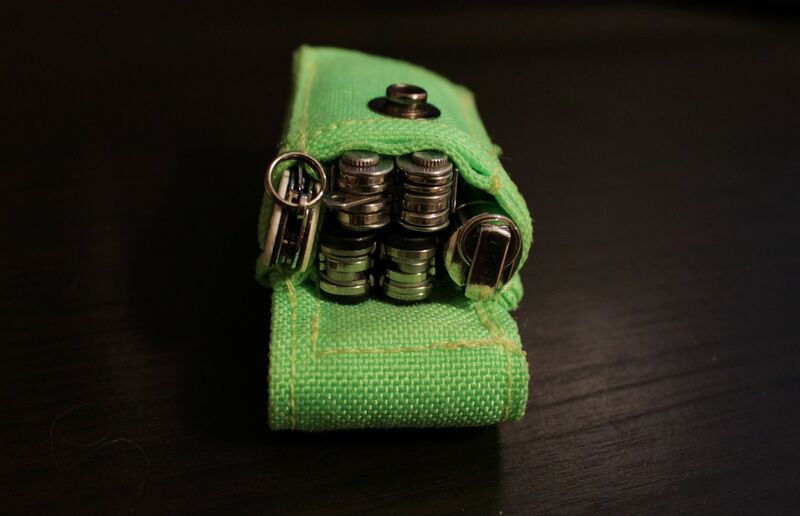 Just because the folding keychain MT's are small, doesn't mean the jobs have to be also. They are far more useful (imho) than just carrying a OPMT. They are extremely capable, and just cool to have. 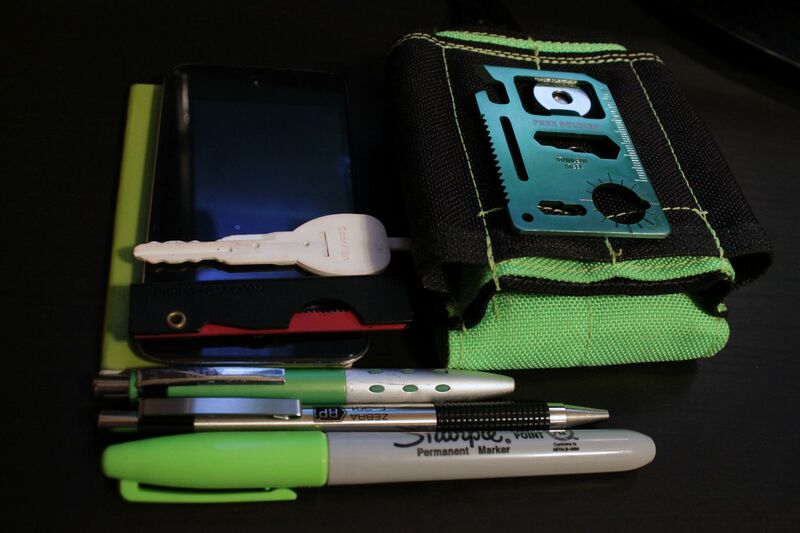 Now that extra keychain setup can be doubled in size and utility, and can stay out of the pocket for good. The Micro, as you would guess, is larger than the nano, and quite a bit larger-though it does not reflect much by looks. By now, hopefully you can see that looks are deceiving when it comes to Skinth, and are surprisingly small on the belt and in the pocket-but that does not directly relate to actual carrying capacity in any way. 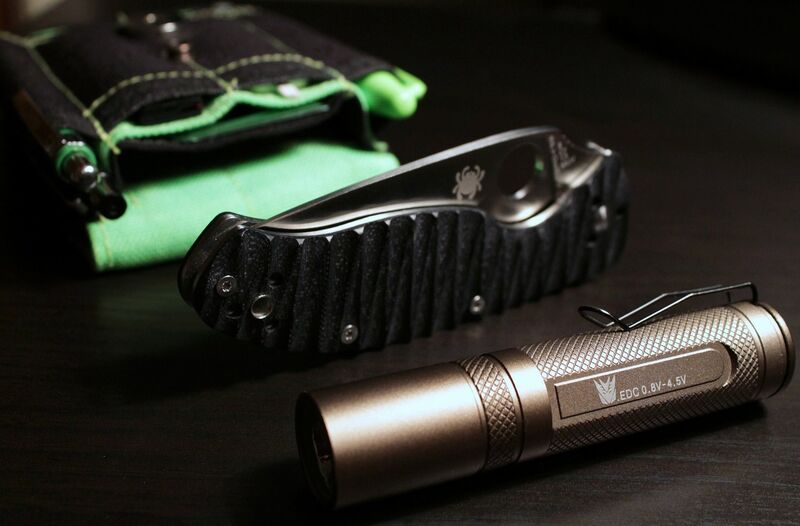 When I first got the Micro, I was surprised to find out how well it housed my Wenger s16 evogrip, and wasn't sure if specs were all up yet on the Skinth site-but it just so happened I wanted to try out the Micro for kicks, and had also just won the Wenger in a giveaway. Doraemon, Notx, WWW and 12 others like this. Very nice review, love the pictures you took! It's so hard to try to save money when these are still out there, and improving constantly! Gnarly, metropolicity and Cornholio2188 like this. The thing is, even with the older Skinth models, you can guarantee they are much better than other companies "improving" products...but the new Skinths keep outdoing the old ones. I know you're talking about Skinth alone, but it's just the designs and process of the build that improve-not the quality. I'd be happy with any of the old Skinths-but I'm also a sucker for these beauties! You're exactly right. The build quality of my "old" CP is fantastic, even if it's "outdated" by newer models being created and design changes being made. I actually wanted one of those after I got my SP-it's only gona be outdated when people have chips installed in their hands that they take calls from. I'd have to go into the glove business then. Mighty Max, Gnarly and Cornholio2188 like this. Is there any cover on the inside for the buttons? Yup, they are all sealed in, no scratching. WWW and Cornholio2188 like this. 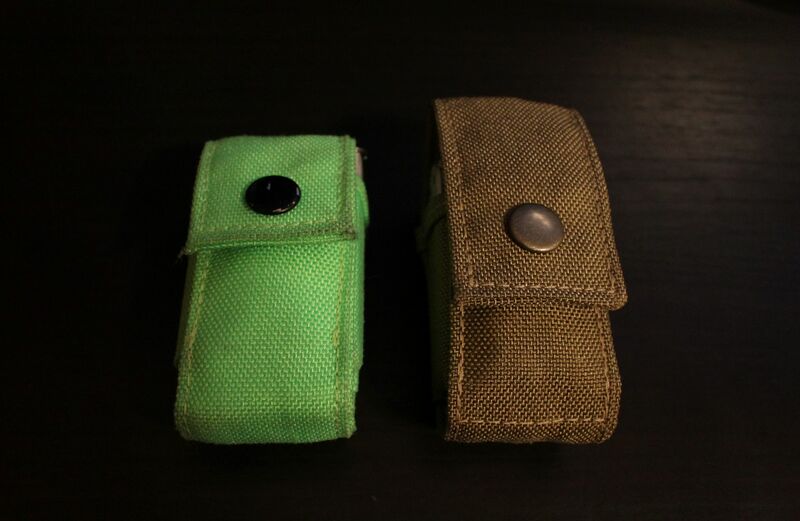 The buttons on both Skinths still look brand new-I baby them, but then again I really don't need to-these guys are meant to last. The most worn one I've seen here is Sakplumber's, but he stresses his under hard daily usage-but I'd be willing to bet he'd go through dozens and dozens of blue jeans/khaki's before he gets a new Skinth-and the thing is, he really won't need to buy a new one even then. Just for cosmetic purposes. Those brass buttons will wear nicely, the black ones are coated black. Will post more of the gf's Skinth I ordered that just arrived today! Stay tuned! Notx, bigfoot, vegassprky and 1 other person like this. bigfoot and Cornholio2188 like this. TR3VVY B, SeL, vegassprky and 1 other person like this. hotpixel and TR3VVY B like this. On a side note-watching the old season of The Walking Dead again, and one of the episodes on today was Chupacabra.